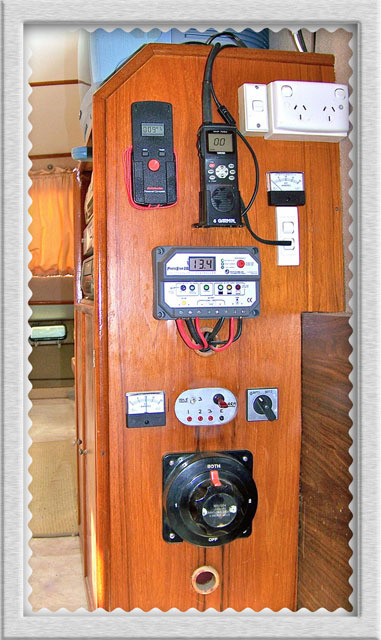 The electrical systems on Shekinah have been designed to enable normal living in two very specific ‘living on board’ situations. Appliances ie. electric jug, toaster, microwave and frying pan etc. A built in 240volt 14 amp battery charger. Remote area living Shekinah has been designed for extended living at anchor and also for extended offshore cruising. Power from the sun and wind are harnessed through the use of an Air Marine wind generator and two banks of high capacity solar panels, both of which supply highly efficient charging to two banks of batteries. In use, two 60 watt solar panels are ganged together to form one bank of charging power. Another two 80 watt solar panels are ganged together to create a second but more powerful bank of charging power. These two banks of charging power can be assigned to charge the two banks of batteries via a rotary switch marked ‘batt 1’ and ‘batt2’. If one battery bank is running down, simply turn the rotary switch to that battery bank. ie. ‘batt 1’. In this situation the two 80watt solar panels are diverted to charge ‘batt 1’ and the two 60 watt panels will continue to charge the other battery bank. Simply switching the rotary switch over to ‘batt 2’ will reverse the charging situation. In this way all batteries receive a continuous charge but you can divert the higher charge ( 2 x 80 watt solar panels) to whichever batteries may be running low. During periods of no sun (at night or on cloudy days) the Air Marine wind generator comes into play and provides charging to either battery bank via two white switches. If there is no wind, battery charging can still be achieved with a small petrol generator supplying power (through the ‘Electrical Intake’) to the built in battery charger. Again, that battery charging may be assigned to whichever battery bank needs the power first. The two battery banks are made up of four six volt, 225AH low maintenance, deep cycle batteries. The four batteries are wired as two separate pairs, each in series to form two very powerful 12 volt battery banks and this is the recommended best situation for using batteries with solar panels and wind generators. In addition to that ‘best’ situation is Shekinah’s dual power supply (4 x solar panels / wind generator), dual power storage (2 x battery banks), a third alternative is a petrol generator to run the built in 14 amp charger and a fourth alternative is Shekinah’s two Yamaha 9.9 HP motors which also provide charging to each battery bank. The port motor supplies charging to Batt 2 and the Stb motor to batt 1. Shekinah’s electrical system also incorporates the American ‘Pro Star 20’ solar charging controller (The large white unit in the middle of the picture above) which is designed to protect all parts of the system but especially the (very expensive) batteries from overcharging.